This brief introduction is not sufficient to make you qualified to ford. River crossings destroy vehicles and kill people. If you don’t know what you’re doing don’t do it. Over half the rivers we used to ford on a regular basis have been bridged in the last 20 years, but especially on the Nicoya and Osa peninsulas it’s still common to come to a stream or river where the road disappears into the water on one side and reappears on the other. You can never assume that because it is the only way forward it must be okay to proceed. We’ve turned around and driven an extra three or four hours to avoid a dangerous crossing more than once. There are a number of factors that go into the decision of whether to cross or not. Obviously the depth of the river, the speed of the current and the traction on the bottom are important. All of these factors are easily judged if you’re lucky and someone else happens along and crosses while you’re deliberating. Most likely they won’t because fords aren’t on high traffic routes. To ford or not to ford the Rio Montana – In a real 4WD or truck this would be easy but in a rented Suzuki Grand Vitara it was a hard call. If it’s questionable you should walk it before you drive it. If you do wade out be extremely cautious and if you don’t have experience with wild rivers you shouldn’t be doing this. 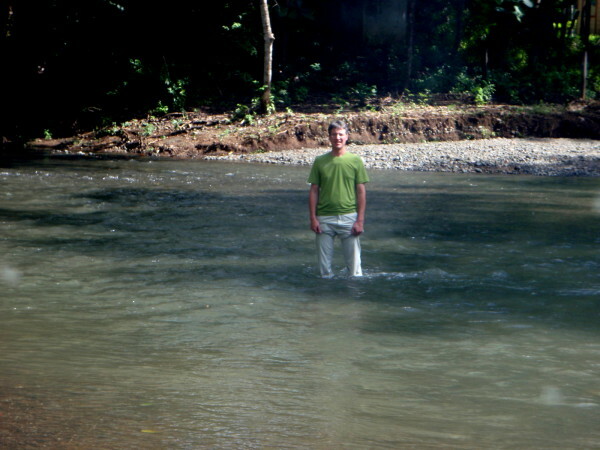 Walking helps determine the shallowest route and identify any large rocks or potholes hidden under the water. All rental car insurance, CDW, total coverage, etc. includes fine print that says basically “null and void if four wheeling or fording rivers.” It doesn’t matter if you’re on a goat path or a national highway any damage will come out of your pocket. Even if you make it across you may not be going much further. Very few vehicles are sealed for submersion and water that pushes up into the engine compartment can temporarily or permanently short out electronics. How close is the nearest tractor? If you do get stuck you’ll need to get pulled out and triple A isn’t going to show up. You should also consider whether you’ve got $50 cash (the minimum recommended tip for water rescue) and how comfortable you might be spending the night right where you are. Do you have cell service? Probably not going to do you a lot of good from a rescue perspective but at least you’ll be able to update your Facebook status from married to single when your spouse leaves you for being such an idiot and flooding the car 25 km from the nearest comfy ecolodge. Sometimes the river is the road. 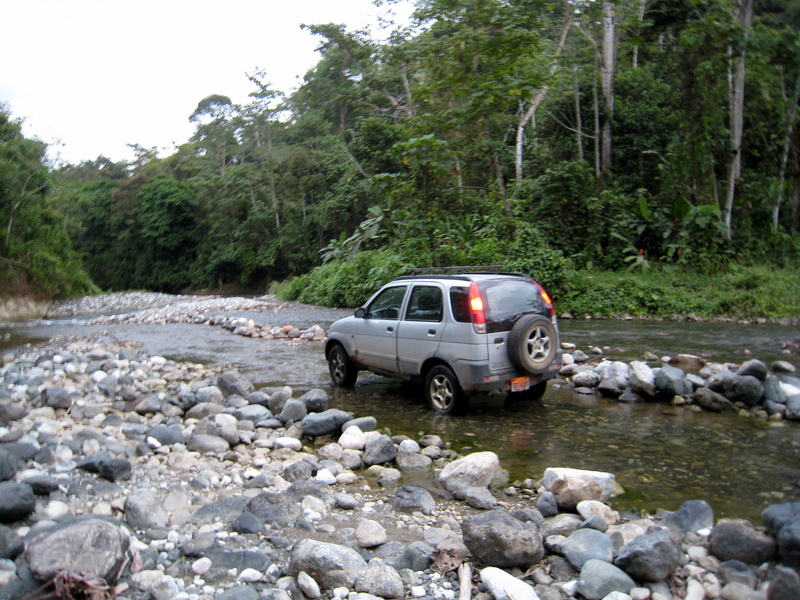 A long ford near Aguila Abajo. The most used route is usually apparent from where the tracks of previous drivers enter the river and exit on the other bank. We’ve encountered several crossing where the exit is 50 or 100 meters up or downstream (depending on which side of the river you’re on) from the entrance. This is usually because one bank is too steep for vehicles where the opposite bank is low and vice versa. There are also some very remote and rugged places where the river is the road and you follow the bed for half a kilometer or more before exiting. It’s a really good idea to know what you’re doing in this situation because if you miss your exit you can end up in serious trouble. As noted above the best route may be determined by walking the river. Often an angled arc across the top or bottom of the ford is the best route. Roll down your window and unfasten your seat belt. If you need to leave in a hurry you probably won’t be able to open the door because of water pressure pushing against it. Lock the hubs and or axle in 4 wheel low if available. Don’t try to just fly through. If you go too fast you’ll create a large bow wave that will push water up over the air intake and you’re done. Don’t go too slow. Without enough momentum you may bog down and not get started again and the longer the engine compartment is wet the more likely it is that water will penetrate sensitive electronics. Once you reach the other side don’t stop to take pictures. There’s still water all over in the engine compartment and it will dry faster if you continue driving keeping the engine warm and bouncing it around for a few km rather than stopping and letting it soak in around the seals on the on-board computer etc. If your engine is still running and you’re just stuck try angling downstream at ~2,000 rpm in a low gear. Remember though that you have to get out the other side so don’t go too far. Reacting quickly is important because everything is getting wetter by the second. If you get stuck and need instructions from us you almost certainly don’t have the equipment you’ll need for an extraction so congratulations you’re about to have an adventure in the rainforest. If the engine dies you’ve got wet electronics – it’s not going to restart. It is likely that trying repeatedly will do permanent damage to the circuits as you try to force electrons through them while they’re soaked. Start looking for that tractor or a nice place to roll out your sleeping bags for the night as mentioned above under “Decide” (oh, and by the way you made the wrong decision). It’s possible the vehicle will restart after drying out overnight or for a few hours in a nice sunny spot (just like that time you dropped your cell phone in the toilet). For some reason it seems like the toughest fords always pop-up around sunset so it’ll probably be overnight. Paved highway or 4WD track you never know when you’ll have to make a decision to cross or not. Heading home around Lake Arenal from Fortuna one evening with Justin and Gretchen we rounded a corner and rolled to a stop behind a line of cars parked in the middle of Highway 142. This didn’t look like a temporary pause and we hadn’t seen any traffic coming the other direction for quite a while so we hopped out to walk to the front of the line to see what was up. A section of the hillside and a massive tree had slid down upstream from the culvert under the road and blocked it creating a 100 foot wide river flowing over the pavement. There was much discussion going on about someone should see how deep it was. No-one was volunteering because the downstream side was a muddy 20 foot waterfall into a swirling rocky vortex. 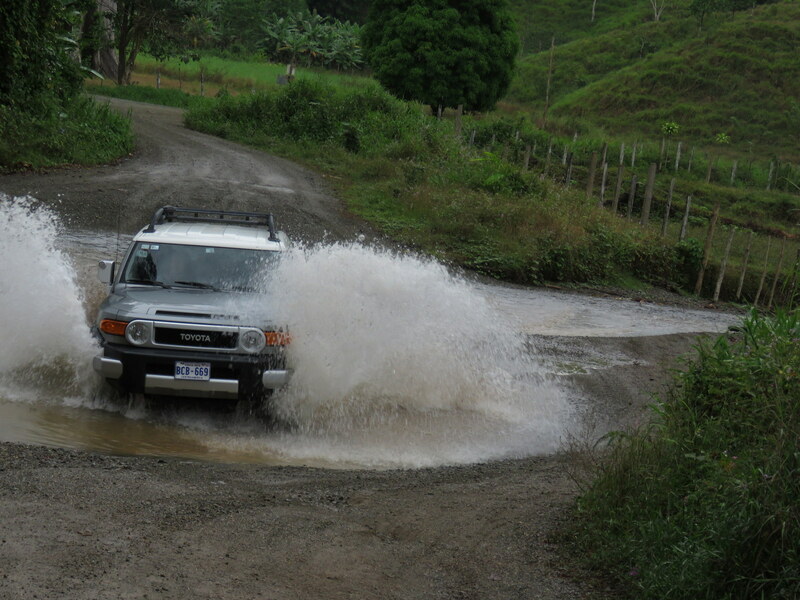 I was about to head back to the car to grab a harness and rope to use as a safety line when a little beat to crap Suzuki Samurai drove past and without a moment’s hesitation into and across the torrent. It came up on his doors but it was obvious our larger vehicles could make it. We jogged back, jumped in, zoomed past the line, through the running water and past the mile long line of cars on the opposite bank while the mob was still trying to make up their minds. Be extremely cautious around unstable hillsides and washouts. A year later a neighbor and his son were killed on the same road when a huge section of hillside gave way while they were inspecting a smaller slide that had blocked the road.